OKMULGEE COUNTY, Oklahoma - People who have paid to have their animals' memory live on are learning that their dogs and cats may not have been properly cremated. This story has a strange connection to Tulsa. A Tulsa pet cremation company was contracting his business only to learn the contractor was burning the animals in the street in Okmulgee County. In rural Okmulgee County, you can hear nature at its best. And you can see evidence that a furry animal was once here. A sheriff's deputy says he saw a suspicious looking vehicle and drove down a rural road, until he spotted a fire. It was at an intersection in rural Okmulgee County where a deputy found more than 40 animals on fire on September 12. He says they were burning on a tarp. The sheriff says 40 dogs, 3 cats and a rabbit had tags on them showing they came from Pets at Peace, which is a Tulsa crematorium. Sheriff Eddy Rice says the owner explained he was subcontracting the disposal of animals because his equipment was broken. News On 6 tried to contact the owner, but no one was there. We did find two testimonials on the Pets at Peace website. One customer writes "the level of service is fantastic...I am consistently impressed by the professionalism of every staff member I have come in contact with." Another adds "In this day and age, it's hard to find a company you can trust...the quality of service was outstanding." Deputies say they also learned that the owner of a golden retriever service dog named Otis was waiting for his ashes from Pets at Peace. Okmulgee County deputies found the dog's remains, had them properly cremated and returned the ashes to his owner. Favorable comments on a website do not always tell the whole story. Buyer beware! 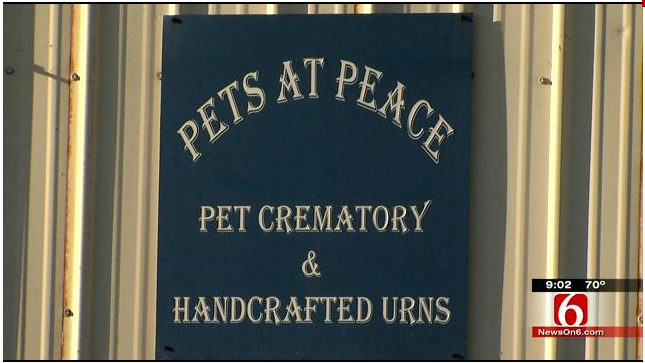 Do your homework - you are paying for a service when asking for a pet cremation, whether you want the ashes back or not. If you want a communal cremation, then you would expect your pet to be cremated and not brought to a landfill or dumped somewhere. If you want a private cremation, you would expect your pet to be cremated privately and the ashes returned to you of just your pet's ashes. Protect yourself and call the crematorium, visit them and ask what kind of proof guarantees the service. Metal discs and paperwork are not irrefutable proof - being present for the service or video certification are the only means of irrefutable proof. Sad that we need to take these measures to protect ourselves against unscrupulous business practices.